All gardeners are familiar with the pivotal role bees and other pollinators play in a productive garden. Their importance intersects everyone's daily lives. Did you know that of the fruits and vegetables we eat, about 75% depend on a pollinator? Approximately 150 crops produced in the U.S. depend on pollinators, including apples, almonds, blueberries, citrus, melons, pears, plums, pumpkins and squash. Pollinators are also vital to plants fed to livestock, as well as to fiber-producing plants, such as cotton. But the world is facing a massive decline in bee and other pollinator insect population, putting our food supply in danger. Bees are the workhorse pollinators. In addition to the familiar honeybee, there are about 4,000 species of native or wild bees in the U.S., including bumblebees, carpenter bees, sweat bees, leafcutter bees and mason bees. The populations of most of these bees are in serious decline. According to many sources, the U.S. has lost over 50 percent of its managed honeybee colonies in the past 10 years. This drastic decline has been named Colony Collapse Disorder (CCD), which is defined in a series of symptoms whose causes are still not fully understood. Many scientists believe contributing factors include pollution, parasites, diseases and exposure to pesticides. A large reduction of plant diversity due to commercial agriculture and habitat loss may also be adversely affecting honeybees' ability to get the complete range of nutrients they need from more limited sources of nectar and pollen. Gardeners can play a major role in helping pollinators to survive and thrive, while also assuring that their harvests are as healthy as possible. Pollination occurs when pollen is moved from a male flower to a female flower of the same species, where fertilization occurs. Once the female flower is fertilized, the process of fruit and seed production begins. Although there are some plants that can pollinate themselves with the help of gravity and wind, most plants need the help of pollinators like insects, birds, bats and other organisms. You can watch as a honeybee visits an apple blossom in search of nectar, and you may see some of the flower's yellow pollen clinging to its fuzzy body or knees. When that honeybee visits another flower, some of the pollen from the last flower is transferred to the new flower. Good pollination results in large, healthy fruits with viable seeds. Poor pollination results in deformed fruits that often drop off before maturing. Construct diverse plantings: Many pollinators are active at different times of year, so include a variety of plants that bloom from early spring through late fall. To attract a full spectrum of pollinators, choose plants of various heights, including flowering trees and shrubs, and those with a range of flower shapes and sizes. 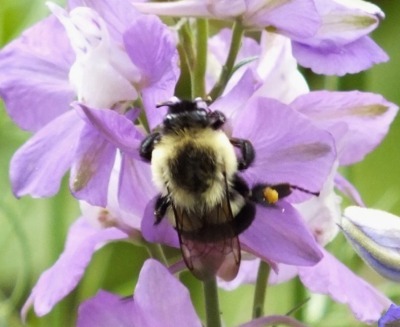 Plant wildflowers and native species: Because bees and wildflowers evolved together, you can be confident that native wildflowers will provide pollinators with an excellent source of both pollen and nectar. Create a habitat: Perfectly proper and neat yards will not provide the raw materials wild bees need to construct their nests. Offer a good nesting environment by preserving a small brush pile, areas with dry grasses and reeds, and dead wood. A muddy area will provide necessary nesting material for mason bees. Single flowers are best: Single flowers, with one ring of petals around the center of the flower - provide more nectar and pollen than double flowers, because the extra petals have replaced pollen-laden anthers. Double flowers also make it more difficult for bees to reach the inner flower parts. Avoid using pesticides: Many pesticides - even organic ones - can be toxic to bees and other pollinators. Use cultural techniques to control pests, such as crop rotation and row covers, as well as trapping and hand-picking. If you choose to use pesticides, use them only as a last resort. Choose targeted pesticides, such as Bt for caterpillars (keep in mind this kills butterfly larvae as well). To protect pollinators, do not use pesticides on open blossoms or when bees or other pollinators are present. Here are several examples of plants that attract pollinators to you garden.